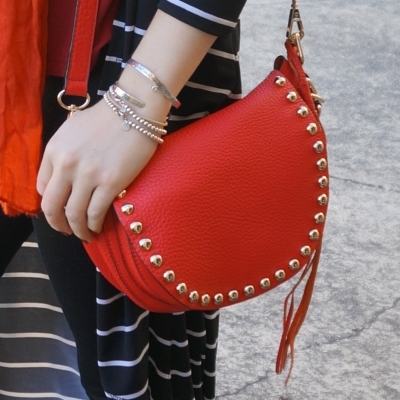 I love this little red Rebecca Minkoff saddle bag! I don't have any other crescent shaped bags so it's a nice addition to my wardrobe and it's just the right size for keeping all my essentials (keys, wallet phone) nearby when I'm out with the toddlers. The crossbody feature makes it a practical choice for a mum! One way to wear such a bright red bag is a pop of colour with a neutral outfit. But for these outfits, I'm embracing the red and wearing red clothing as well for cheerful and colourful winter outfits. Wore this for a busy morning, a few appointments to go to and taking Cooper for a very overdue grooming. While this red cardigan is only a light one, with all the running around I was warm enough, and even took the scarf off when it heated up. This tank is starting to go from a metallic tank to a plain black tank pretty quickly! I think the more I wash it, the less sparkly it gets! It's definitely a keeper though, so soft and I like the way it's just a little oversized, perfect for partially tucking in. Even if it's not as colourful as it once was. The skull print scarf is one I've worn with these printed jeans in the past - I wasn't too sure of it then but I loved it this time around with the addition of the red cardigan. Was really happy with this cheerful and bright outfit. Last worn: red cardigan, taupe skull scarf, metallic tank, Sass & Bide printed jeans, bow ballet flats, Rebecca Minkoff saddle bag. Other ways to wear: red cardigan and button down, taupe skull scarf and printed shirt dress, metallic tank and maxi skirt, Sass & Bide printed jeans and teal henley, bow ballet flats and maxi skirt, Rebecca Minkoff saddle bag and denim shorts. Perfect for pregnancy: red cardigan and first trimester bump. Although the tee's a little more burgundy and the bag is more of a cherry red, I thought they looked nice together and it was just enough red to wear for World MS day! I've worn orange and red together a handful of times - so I knew this lovely ombre scarf would work nicely with the tee. I had been wanting to wear the red tee with the striped duster but couldn't get the half tuck to look right. Added the scarf and I was instantly happier with how the tee looked untucked. I really really liked this outfit, which made it all the more frustrating when it was promptly ruined by a potty training toddler. Thankfully everything was machine washable, and it happened after Baby Boy's specialist appointment. Last worn: striped duster, ombre scarf, red tee, Prima black skinny jeans, tan boots, Rebecca Minkoff saddle bag (above). Other ways to wear: striped duster and flares, ombre scarf and striped tee, red tee with double denim, Prima skinny jeans and printed kimono, tan boots and printed dress, Rebecca Minkoff saddle bag and shorts. Perfect for pregnancy: striped duster and maternity shorts, red tee in the first trimester, skinny jeans and a hidden belly band. A red bag is a fun pop of colour with a neutral outfit, but don't be afraid to wear some red in your outfit too! The red shades don't have to match exactly to look good together. You can make an outfit like this with any colourful bag, it doesn't have to just be a red one. Have fun creating easy and colourful outfits when you pick a piece of clothing to wear that's the same or a similar shade to the bag you're wearing. Linking up with Fashion Files, Fabulous Friday, Flashback Fashion, Passion For Fashion, Friday Faves. Cute bag! Love Rebecca Minkoff! I always gravitated towards mashinewasheable things, but after having kids it became non negotiable! Yes, it's an essential with toddlers! No wonder you like this bag as I think the shape and colour are both perfect! And I agree - a red bag gives always such a wonderful little dab of paint! Like both of your looks with the cardigans. As usual you look good and I like it how you took the pieces together. I adore these bursts of red with these outfits! This is such a great look (I like both of them, the first one most). Lovely, Mica! Hi Mica, I really like the red bag. Now that I think of it, I don't have a red bag anymore. This week I went through some of my bags and have to say that at least five will go. I don't have space and am focusing on better quality ones, like you. You can always tell when looking at your outfits that the bags are A+ and this gives it a step up. The cross body bags are so practical and not to mention, adorable! I love the pop of red that this bag gives to any outfit! You look fantastic! 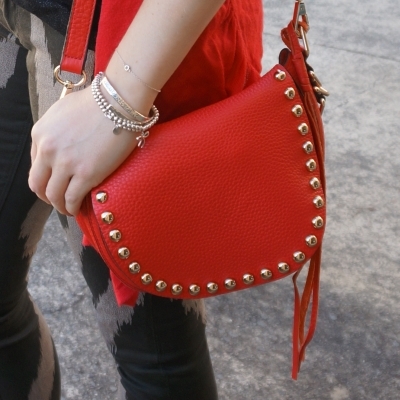 I love the red saddle bag, it's so cute especially with those Sass & Bide skinny jeans. They go perfectly together! I love how similar these outfits are but at the same time, they’re completely different! That red saddle bag looks right at home on you. I love how you’ve added a touch of brown to both looks! I love the colour of your Rebecca Minkoff saddle bag. It's the perfect accessory for neutral outfits because it gives a nice pop of colour! Loving both ways you styled that bag babe! I love this bag and the pop of red it adds to this look! Such a lovely outfit!! Looks good on you! Oh my! I LOVE this bag! One to add to the collection I think. Loving the McQueen scarf - the black one I have doesn't hold up well to the Sydney cold so it's been stored away! That is such a fun bag, I love that bold red color! Oh no, good luck with potty training--man that can be so frustrating. Especially when you have another little one to tend to! Hope things go better soon! Thanks! Like everything in parenting, it's stressful but never lasts long! I love this RM bag, it is just so beautiful. Love how you styled it! LOVE that bag! You have the best collection, I want to raid your closet! These leggings are so fun! I am loving your collection of RM bags! They are the perfect accessory to any outfit! Such a fabulous bag! Those printed jeans are so fun and the second look is so chic! Mica, I'm loving this red on you! What a fabulous RM saddle bag! It's really sharp. Love both of these outfits! This saddle bag is really cute. It compliments both of your looks wonderfully. Your first look is so striking - those jeans make a true statement! Thanks for linking up with Fabulous Friday!